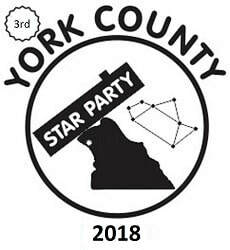 2018 dates - YCSP star party begins Wednesday, July 11 noon and ends Sunday, July 15 at noon. ABOUT THIS YEAR'S DATES--PLEASE NOTE: Last year, 2017, with less than optimal observing for Saturday night, we completed talks and activities by dinnertime Saturday, and many people chose to head home after the raffle drawing and dinner. I am planning to repeat that scenario for those who wish to make holiday weekend plans. If the weather is cooperating, anyone wishing to come early or stay for the weekend is welcome but please contact me - Phil DeRosa - starpartyphil@comcast.net in advance. Busy Bee will not be available for meals for Sunday or Monday or on any extra days. 2018 Star Party has started - see photo above. Star Party contact: 717-891-8380 or email starpartyphil@comcast.net. You can Google "Wizard Ranch BSA" or "New Birth of Freedom"
Additionally there will be a number of signs to YCSP, posted along the US 30 and later on to guide you to the site. This site is very flat and you can view sky horizon to horizon. Situated at an elevation of 154 m above msl, the field is very flat, pitch your tent or your camper. The site has hard packed turf with good run-off and mud is not a problem. Cell phone coverage is fair and depends on your carrier. Busybee has been the catering vendor, and offers an excellent menu at reasonable prices. Please also read "Rules and FAQ's" Page for more details.